Everytime teachers do something new for their students. Some of the efforts are extra-ordinary. They do it for better future of students, school & villege or place. Some teachers see problems during their work. Due to such problems, they undertake innovation to make the thing simple. These innovations are very helpful for other teachers too. Such innovations by teachers are submited to IIM-A (Indian Institute of Management-Ahmedabad) and they have their Innovation Bank. You are doing something with education or in class, you can also submit your innovation to IIM-A. This is only for goverment teachers. For better education Goverment of Gujarat also support this programme. From result of this we celebrated two innovations fairs past two years. You are doing innovation in your class. Then IIM-A want to know about your innovation in education. They public your innovation to their official site also to help other teachers. How to submit your innovation? There are two different ways to submit your innovation to IIM-A. These ways are online & offline. Earlier teachers submited their innovation through DIETs in their district. But now a day, IIM-A makes the way easy to reach such teachers for innovation. Lets see both method for submit innovation. 1). 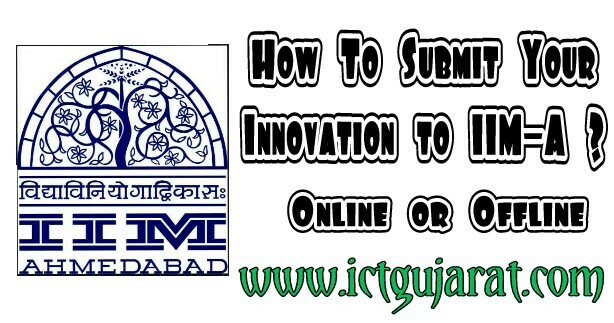 You can directly submit your innovation to IIM-A through its website. Go to IIM-A official innovation site. Follow the steps for submission of innovation and submit directly to IIM-A. The official website is as below. You can see all previous innovations from menu on this website. There is one PDF file for submit steps in Gujarati. Go to site. Read and follow the steps as in PDF file. That's easy. 2). You can also submit your innovation through email. Write your innovation in english or gujarati in word or pdf file. Then send it to below mail address. Innovation should be written in its formate. To know formate read more here for offline method. 1). Download innovation form as given below and post it to given address in it. There is a PDF file of innovation form with IIM-A address in it. 2). You can dowload above form and write your innovation on it and you can submit your innovation as hard copy to your DIET in your district. So these are easy ways to submit your innovation online or offline. Let world know about your innovative work. Let help other teacher against the problem that you faced. Do innovation for better education. Thank you.